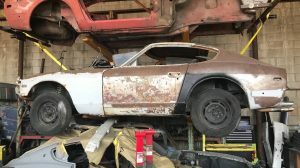 Variety is the spice of life, and while we see our share of Camaros here at Barn Finds, seeing a 1981 Z28 Convertible is a bit of a new experience. Barn Finder Cheato spotted this one for us, so thank you for that Cheato. The Camaro would have been sold brand new as a Convertible, but the actual conversion work was completed by an outside contractor. 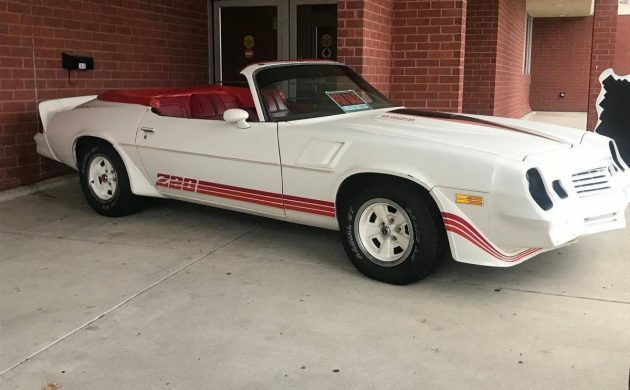 The fact that these cars were sold directly off the showroom floors of various Chevrolet dealerships as new cars make them as close to a factory Z28 Convertible as it was possible to get in 1981. Records and solid information are now difficult to find, but I think that there’s a fair chance that we will have some readers who can fill in the blanks, or correct me on any errors that I might make on this one. The Camaro is located in Decatur, Illinois, and is listed for sale here on Craigslist. The owner has set an asking price of $12,500 for this slightly unusual classic. 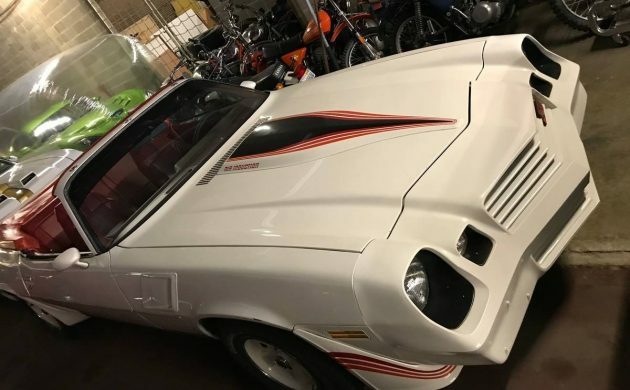 The Z28 rolled off the line in 1981, and it then would have found its way straight to a company called National Coach Engineering (NCE) of Port Sanilac, Michigan. NCE then installed reinforcing and bracing under the car, cut off the roof, welded in some fabricated panels and pieces, and fitted a custom-made sailcloth soft-top. The Camaro Z28 wasn’t the only beneficiary of this creativity, as NCE also performed similar work on the Pontiac Trans Am during the same period. These conversions were all performed on these models between 1979 and 1981, at which point NCE went bankrupt, and the factory closed. The factory premises in Port Sanilac still exists, but it is now a storage facility. The failure of the company has led to one major problem: The company’s records have all disappeared, and no-one is sure just how many conversions were performed. I have found some information from the period that suggests that NCE stated that they needed to construct 175 cars for the project to be viable. However, various sources have since quoted build numbers as being anywhere between 100 and 400 cars, and that this number was split across both the Z28 and the Trans Am. Other sources do suggest that NCE actually files for bankruptcy in 1980, and continued to undertake these conversions into early 1981 in contravention of its bankruptcy requirements. This is said to have resulted in only a handful of 1981 models being built, of which this Z28 would be one. 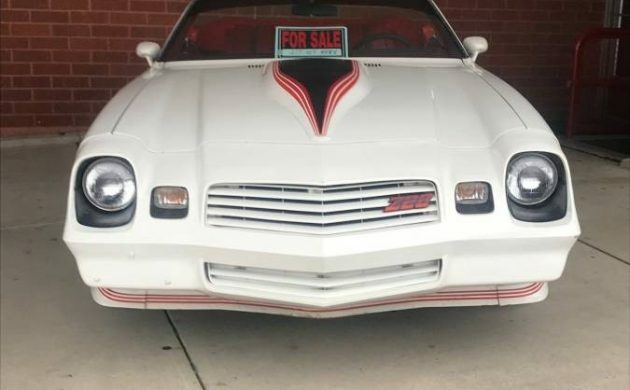 One fact that doesn’t seem to be in dispute is that significantly more Trans Ams than Z28s underwent conversion, making the Z28 the rarer of the two. Another is that these cars were expensive. Like, really expensive. If you wanted to become the proud owner of a new Trans Am or Z28 Convertible, then you could expect to pay around 80% more than standard list price for a regular Z28 or Trans Am. That was a lot of money back then. The Trans Ams and Z28s were being sold off the showroom floors in Pontiac and Chevrolet dealerships, so were as close to factory convertibles as it was possible to buy at that time. This particular Z28 has survived quite well and appears to be the product of careful ownership. The paint is original, and the owner claims that the car is rust-free and that it has never been driven in Winter. It looks like the original NCE manual soft-top has survived, and it would be great to gettimg a look at the condition of that. The soft-top material was known to be prone to getting pinched in the frame hinges when the top was being stowed, which could lead to holes and tears. This wasn’t a problem if the top was stowed carefully, but could happen if the owner stowed the top in a hurry. The top has a cover to go over it when stowed, just to keep the appearance neat and professional. Otherwise, the rest of the car is pretty typical 1981 Z28 fare. You got the 175hp 350ci V8 engine, and an automatic transmission. 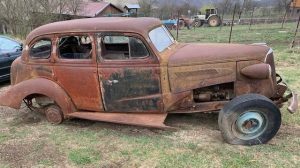 The owner states that the car is numbers-matching and that the only non-original parts are the battery and tires. We also know that the interior trim is red, but we don’t know what condition it’s in, or what optional extras, if any, have been fitted. However, given the external appearance of the car, I would expect the interior to look pretty nice. 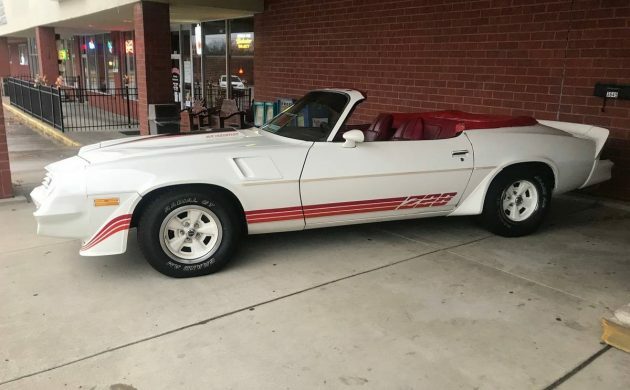 Well, that’s what I’ve been able to find out about the saga of the Z28 Convertibles, but this is one of those cars where background information is incredibly scarce. I really hope that some of our readers might be able to fill in the blanks, as a lot of the history of NCE and its conversion work has now disappeared with the company’s records. Otherwise, are any of our readers tempted to by a 1981 Camaro Z28 that is sure to stand out in a crowd? Price is attractive. I’d like to see it with the top up however. I wonder how many people stop and say “didn’t know they made a convertible in 81”.. I’ll bet that would get tiresome after awhile. I realize the whole point of the top down pictures is to accentuate the rarity. Even so, it would be nice to see some pics with the top up, the underside and inside the trunk. If it was a factory 305 4-speed it would be a twin to my ’81 Z/28 hardtop. Hey, at least the roof part won’t squeak. It’ll just kinda rustle. Not so sure there would be a lot of ‘cowl flex’. these conversions came with a full factory warranty – they were not a fly-by-night conversion done in a back alley by someone with a hack saw and a few rolls of emory cloth. Having seen one or two back in the day (I grew up in a suburb of Detroit) the hardtop looks a lot better than the convertible with the top up. That sloping rear does not translate well to a convertible top. I understand why all the pictures are taken with the top down. If you had to have an 80’s Camaro or Firebird this might be the one to get although it would be light years better with a manual transmission (never offered in the convertibles iirc). I am intrigued that in one of the photos it appears there are other cars in the background and it appears they are sealed in plastic? If this car received the same treatment, and it was done correctly, this could be in fantastic shape. 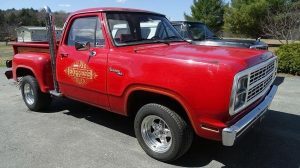 At the current ask of $12,500 you could decide to drive it as often as you wished, or tuck it away and see if it appreciates in value over time. Me? I would drive it on really nice days. Nice car, rare indeed and I always liked this body style. I am interested in the 2 vehicles hanging out in the “bubble” behind the Camaro…..Maybe a Dodge Viper and a Olds 442 ?? The white/gold car looks like a 1969 Hurst/Olds. No top up pictures because they’re so ungodly ugly with the top up. Plug it into the google machine and brace yourself. Here’s a good shot of one with the top up. My God! Put it back down, please! It looks like the roof hooks on over the windshield and there is 2 holes on the outside painted surface where it clasps. My 1988 Iroc convertible by ASC hooks on the inside and I think is a better idea and cleaner look..
No mention of miles on this one and I do not see any interior shots. I would prefer a hardtop in this case. Did anyone else notice the bottom of the driver’s door damaged? I hate these cars with the top up. Geez it really doesn’t look good at all with the roof up. This car looks pretty fair for the price. I would consider owning it. Would make a terrific weekend cruiser. Buy it and drive it. I can see why the factory didn’t bother making a F body convertible after 1969. I have to ask, if you are selling a car could you please add pics of the interior, the engine compartment, the trunk, detail photos, and close ups? I think you would attract many more buyers with this information and also sell your car quicker. Would not be a bad idea to get some pics of under the car, and more information as simple as how many actual miles the car has. Just saying…The more information the better. This is the first one that I’ve seen. I didn’t know that they had these available. Quite simply, that is one ugly-a$$ car. A lot of these after-market convertible conversions were ugly with the top up, some even ugly with the top down lol. I had a 1985 Chevy Celebrity convertible, a Hess & Eisenhardt conversion, for a few years. I bought it with 80,000 miles & sold it with 99,000. It actually looked BETTER with the top up lol. Of course, it rarely was up. Why have a convertible if you keep the top up? If that’s the case, save some money & buy a coupe lol. I lost my a$$ on that car. Bought it for $4,500 & sold for $1,200. But I had enough fun with it that I didn’t care. As for this Camaro, I definitely prefer it with the top down. Could be a very fun car to own. I agree, top up ugly.. But who buys a convertible to drive around with the top up anyway?? Unless in a pinch caught in rain. Not like this would be a daily driver for whomever buys it. They will drive when its nice out or to car shows with the TOP DOWN. And it looks bad azz with the top down. 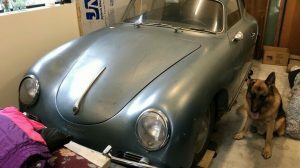 Seller offers zero evidence that he has a true convertible with folding top versus a sawed-off roadster.